Preheat the oven to 200°C, gas mark 6. 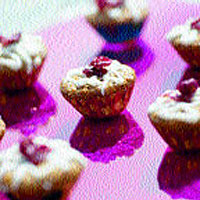 Line two 12-hole mini muffin tins with mini muffin or petit four cases. Mix the dry ingredients in a bowl. Make a well in the centre. Mix the wet ingredients, pour into the dry and stir for about 20 seconds until you have a lumpy batter. Don't overmix. Spoon into the cases and bake for 15 minutes. Cool on a rack. To finish, melt the chocolate, scrape into a polythene bag and cool so it thickens a little. Cut a tiny hole in the corner of the bag. Drizzle the chocolate over the muffins and top with dried cranberries.